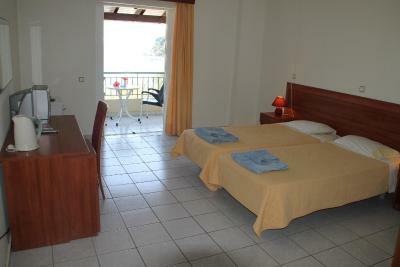 Lock in a great price for Amfitriti Hotel & Studios – rated 8.1 by recent guests! Staff, view and beach. Air conditioner was excellent. It was only five minute walking from the Lakka village where you can find everything. 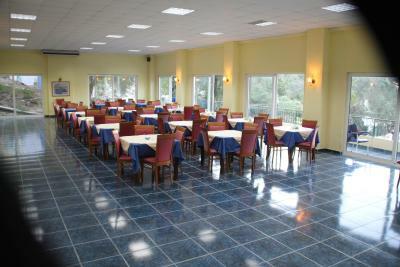 Tavernas, bars, cafés, boutiques etc. 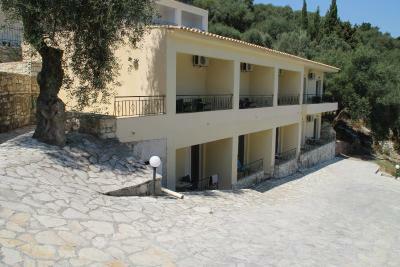 Great location in walking distance to beach and village. Large Pool, good size room and good views from balcony. The size of the room, plenty of space and cupboards. It was clean and the beds were very comfortable. Best of all was the view from the balcony. The hotel location is amazing just infront of the beach. The room is basic but has all the stuff we needed kattle , microwave and a small fridge. The village lakka is 5 mins walk with all the restaruant , shops and everything that is open till after mid night. Location was spot on. The view was lovely. Room was clean. Manager great at arranging transport etc. Hotel driver happy to pick up from port / no trouble giving lifts anywhere on island which was a great help. I recommend the Amfitriti hotel first of all for its superb waterfront location and secondly for the way we were treated by Marilly. Is amazing to have the possibility to make bath in the Ionian Sea non stop, no matter the hour :)including night. Amfitriti Hotel & Studios This rating is a reflection of how the property compares to the industry standard when it comes to price, facilities and services available. It's based on a self-evaluation by the property. Use this rating to help choose your stay! One of our top picks in Lákka.Surrounded by lush greenery and only steps from Harami Beach, this family-run hotel features a small pool with poolside bar, sunbathing terrace and spacious rooms with furnished balcony overlooking the sea or the garden. Each of the air-conditioned rooms at the hotel Amfitriti includes a kitchenette with refrigerator and an electric kettle. A TV is provided. 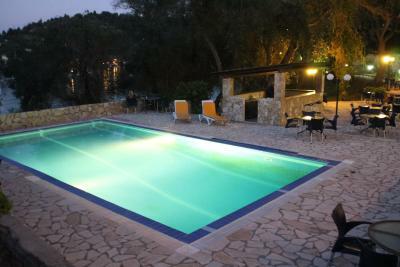 Right in front of the hotel, guests will find the crystal clear waters of the Ionian Sea, which comes with lounge chairs. 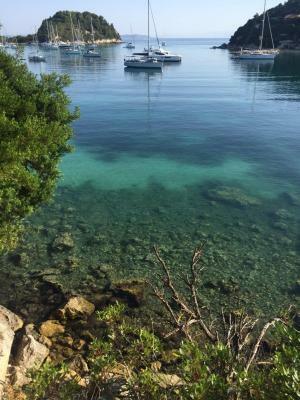 Lakka is just 500 feet away. When would you like to stay at Amfitriti Hotel & Studios? This room includes a luggage bench, built-in wardrobe, coat rack, dressing table and private balcony with sea or garden views. Kindly note that 1 of the beds is a roll-away bed. House Rules Amfitriti Hotel & Studios takes special requests – add in the next step! Amfitriti Hotel &amp; Studios accepts these cards and reserves the right to temporarily hold an amount prior to arrival. Amfitriti Hotel & Studios accepts these cards and reserves the right to temporarily hold an amount prior to arrival. Please note that the hotel offers transfer to/from the port. Guests are requested to inform the property in advance if they wish to make use of this service. Contact details can be found on the booking confirmation. The access for vehicles is very steep. Nothing about the hotel. Its a very good value for money. But it is worth mentioning that the area (lakka) has alot of climbing and not suitable for people with disabilities. The pool was absolutely filthy, broken edges, my 6 year old cut his back in his one dip. There was a half deflated lilo / boat floating in the pool for the whole 6 days we were there which summed up the 'unloved' feeling that this property gave off. With such a superb location it was so frustrating, there is no passion or pride for the business and it felt only minimal effort applied to keep it ticking over. There is no excuse for the pool, which is why I feel we have to review as such. I came away feeling a little deflated myself! 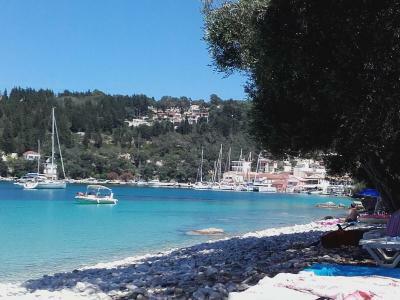 The location is perfect, directly in front of the beautiful sea and 5 minutes along a coastal path from the village of Lakka. The view from my room over the bay was stunning. Guests at the Amfitriti can have free sunbeds on the beach and of course around the pool. A private transfer service (Jimmy!) is offered to and from the ferry port and it is easy to request a ride to other nearby villages too. My room was a very good size and very quiet, with towels and sheets changed every other day. 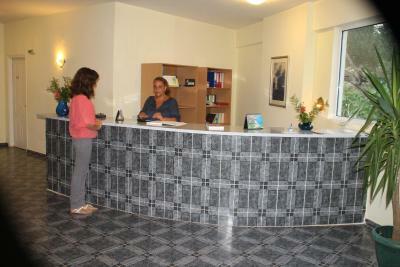 Guests are also provided with beach towels if required and Marie and her team were always very helpful. The floor in the bathroom was always wet, there is a little problem with the draintrap. Location is nice, very beautiful view over Lakka harbour. We are satisfied about our choice. 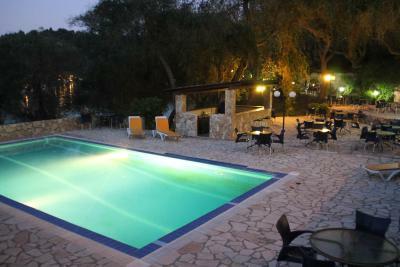 Hotel is very close to centre of the village and tavernas, just 5 minutes walking near sea. Dimitri, the driver, also, always available if you need a ride by car. We really like the place so I hope the following would not be taken as negative criticism rather than suggestions for improvement. The lighting in the room could be brighter; a shower curtain in the bathroom would help in avoiding getting slippery floors; bathroom tiling need re-grouting and broken tiles and silicon seal around bath need replacing. Kitchen units should be kept together instead of haphazardly placed in the room and a dish drying rack and shelves/drawers for dishes & cutlery provided. Proper double beds (as opposed to two twins put together) would also be nice. The location, generous sized apartments, fabulous views from the balcony, beachfront with free loungers for guests to use, swimming pool (which we never used, the beach being right at your doorstep), the larger of only two pebble beaches in the area, set amidst terraces of olive groves, 5 minutes leisurely walk along the coast to the pretty Lakka village/town and its amenities! (shops and restaurants), friendly & helpful staff. 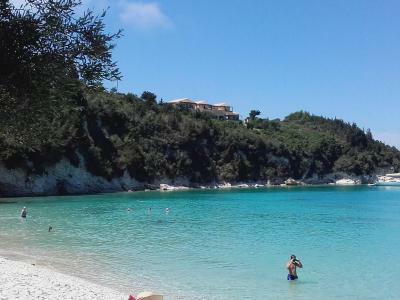 Very nice hotel in front of the best beach in paxos, we spend here 7 night and we had a great time, the room was the best with a great view from the lakka bay, nice and clean and very comfortable, the lady owner was very nice and friendly and all staff was great. I really recommend this place for a great and relaxing experience! Two single beds pushed together but this is very common in Europe so no big deal. The kitchen was quite limited but fine for cooking a basic breakfast. Everything else was excellent so these are minor. Loved the place! 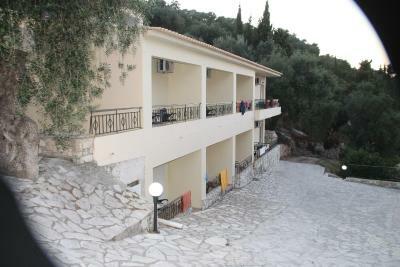 Fantastic location right on the best beach in Lakka. Marilly- the owner is lovely and super helpful. She helped organise transfers with Jimmy their driver all over the Island. The beach is amazing and you can order beers/drinks/snacks delivered to your sun lounger for great prices. Our room had an amazing view of the the cove and was 1 min walk to the beach/5 minute walk along the shore or a quick swim to town for drinks and dinner. I would come back every summer and stay here if I could. Perfect for a couple or friends/family.